A wonderful early example of an antique painted steel cabinet. A fantastic & very unusual heavy gauge industrial cabinet in the original 'faux wood' painted finish. 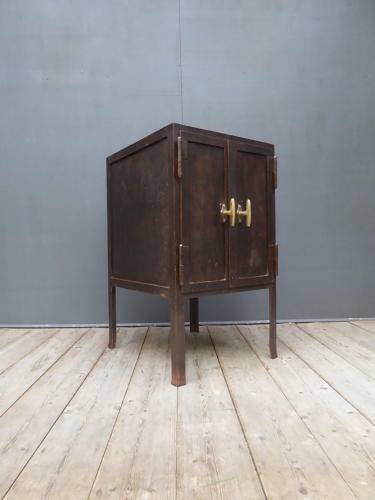 Raised on four legs with a wooden top, twin doors & large beautifully cast brass handles. An absolute stunner. Wear commensurate with age, very good overall & ready for use. The divided interior could be cleaned further depending intended use. UK courier service available, please enquire for details.